I first made this easy peasy recipe from Chatelaine (one of my fav mags) for Mama's Day brunch last Sunday and then, because our mamas liked it so much, I made it again later that same day (we had friends over for a bbq). The second time around, I zhouzhed it up by serving it alongside angel food cake and whipping cream. Scrumptious! This minty-gingery goodness is a fantastic way to enliven fruit salad. Frankly, I think this syrup would be lovely in a cocktail, too. Let me know if you do end up trying it. I made a double batch yesterday to enjoy throughout this long weekend. Speaking of which.... Happy Victoria Day weekend to my Canadian peeps! I hope it's a good'er. 1. Finely grate 1 tsp peel and squeeze 1 tbsp juice from a lime (Disclosure: I used the peel & juice of an entire lime with no ill consequences). Peel, then thinly slice, a 1 inch piece of ginger. Place ginger, 1/4 cup chopped fresh mint, 1/2 cup granulated sugar, 1/2 cup water, lime peel and juice in a small saucepan. Bring to a boil over medium-high heat, then reduce heat to medium. Simmer uncovered, without stirring, until syrupy, 2 to 3 minutes. Strain, then cool at room temperature or in refrigerator. 2. Prepare 6 cups fresh cut fruit, such as pineapple, raspberries and strawberries. Arrange on a platter and sprinkle with a handful of blueberries. 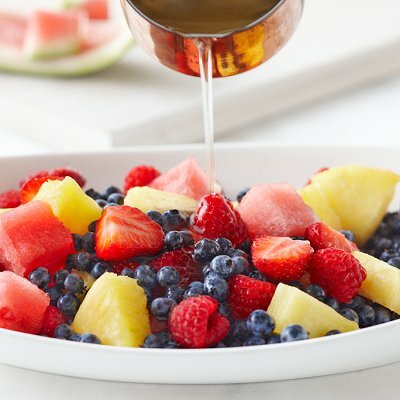 Drizzle about 3 tbsp syrup over fruit just before serving. Refrigerate syrup in a sealed jar for up to 1 week. Prepare fruit up to 1 day ahead and store in the refrigerator in separate resealable plastic bags. Bring to room temperature before serving. p.s. I ended up taking a double batch camping with us and our friends loved it too. Yay! This recipe's a keeper.